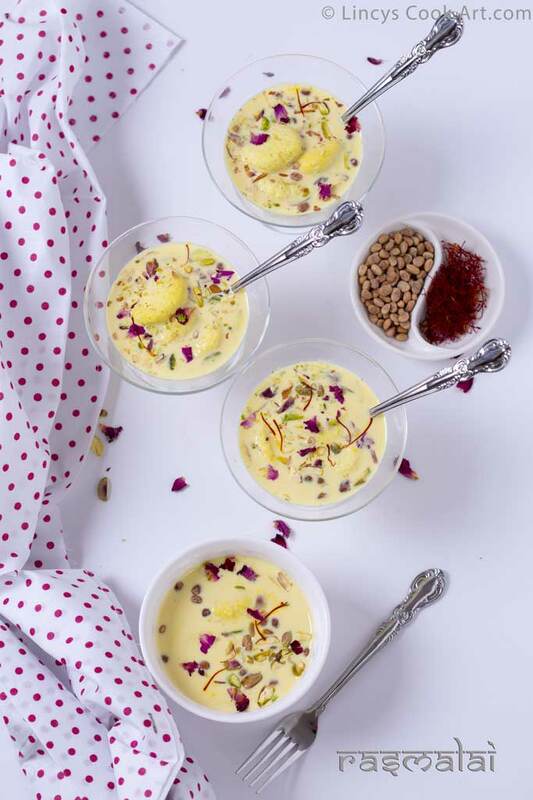 Ras malai or rossomalai consists of sugary white cream, or yellow-coloured (flattened) balls of chhana(milk solids) soaked in Malai (clotted cream- Rabri| Rabdi) flavoured with cardamom. It is cooked in sugar syrup and then kept inside the rabri with saffron,pista. 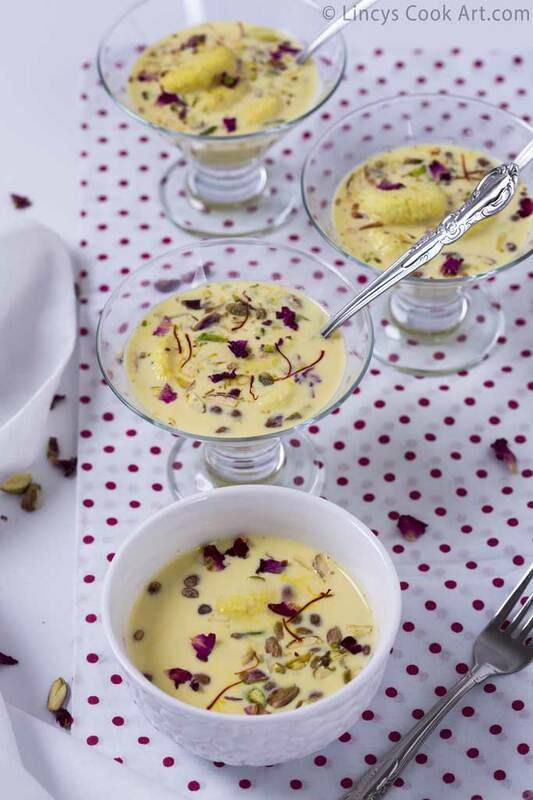 You could make rasmalai with milk powder too as a quick version. 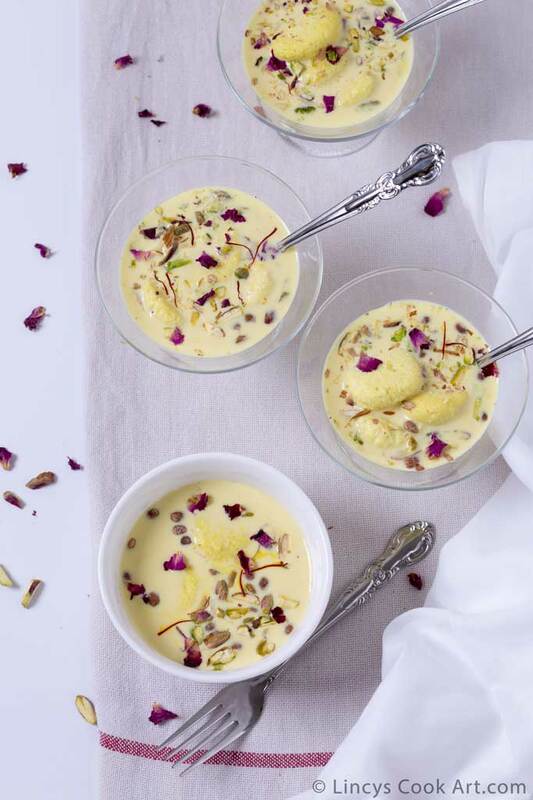 The name ras malai comes from two words in Hindi: ras, meaning "juice", and malai, meaning "cream".This dish was invented by the Bengali confectioner and businessman K.C. Das in the year 1930. 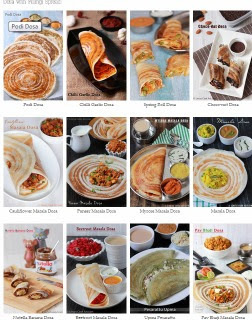 Originated in West Bengal. This dessert is popular and served in India, Pakistan and Bangladesh. Refer here for the recipe. I have prepared same quantity and added pinch of turmeric powder for the colour. Sugar syrup i have prepared half the quantity mentioned in the recipe as the rasgullas are finally dropped in rabri to make rasmali. 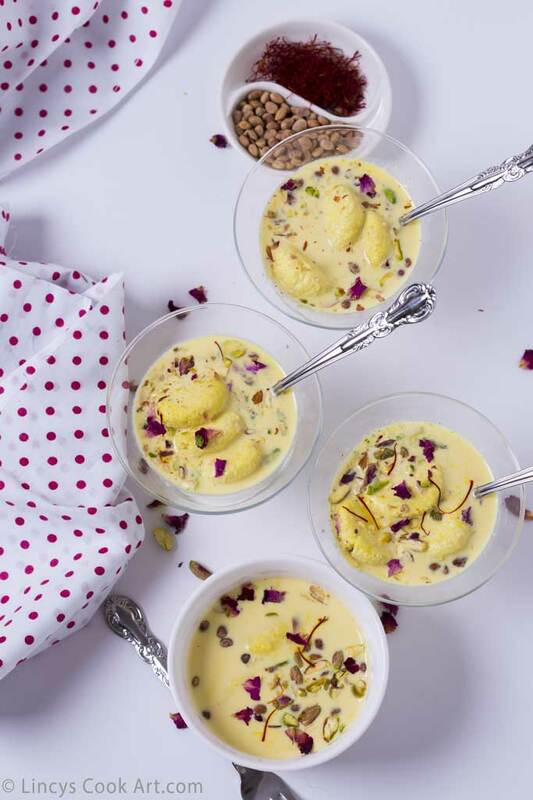 Prepare rasgullas by adding a pinch of kesar colour or turmeric powder to colour the chhena for rasgullas to prepare the rasmalai (optional). Take a heavy bottom pan and boil the milk once it starts to boil reduce the flame and keep on stirring to avoid catching on the bottom of the vessel. Cook around 20 minutes till the quantity of milk reduce to half. Keep on stirring till the milk further thickens and the malai (yellow fat layer of milk) starts to form on top. At this stage add the sugar, saffron and cardamom powder; mix well to dissolve the sugar, this will dilute the basundi slightly and sweetens. Cook further more to make it thick by scrapping the sides frequently till layers of malai (fat layers)formed. Add the crushed nuts and cook for 2 minutes and switch off the gas. Allow the rabdi to cool for about 1 hour. Remove the rasgullas from sugar syrup and gently press to drain the absorbed sugar syrup and keep it inside the cooled rabdi and allow to soak some time. Gradually cool Refrigerate and serve chilled.